Using this noninvasive technology, we scan your teeth to examine your tooth structure. 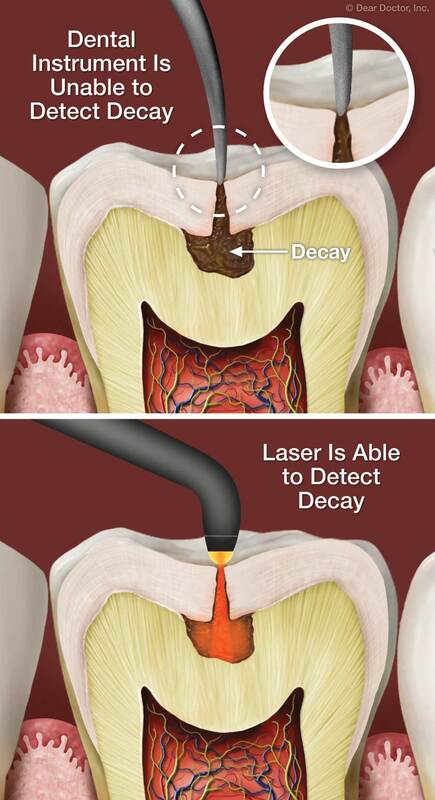 Laser cavity detection is based on the fact that healthy tooth structure absorbs and emits light, or “fluoresces,” differently than does decayed tooth structure. Healthy teeth will have little-to-no fluorescence while teeth with decay display with a higher level of fluorescence. And the higher the fluorescence, the more advanced the tooth decay. Once we complete the scan, the fluorescence readings are converted into a digital numeric output. You will also “hear” when you have decay present, as changes in fluorescence and numeric value are emitted as an audio signal that goes up in tone as it denotes the presence of decay.